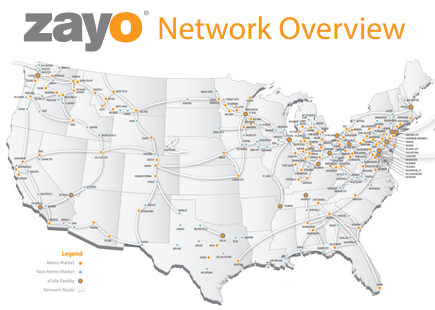 Zayo has expanded its 100G Wavelength network service on the Seattle to Los Angeles fiber route. The carrier began its 100G rollout late last year and already offers 100G wavelength services along the eastern corridor including New York City, Philadelphia and Washington D.C. Additional routes, including Seattle-Chicago and Chicago-NYC, are also running. 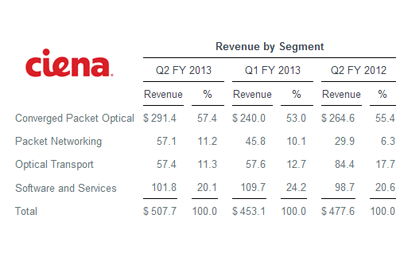 Ciena reported revenue of $507.7 million for its second quarter of fiscal 2013, up 6.3% YoY and up 12% sequentially. Ciena's net loss (GAAP) was $(27.1) million, or $(0.27) per common share, which compares to a GAAP net loss of $(27.8) million, or $(0.28) per common share, for the fiscal second quarter 2012. “We have designed Ciena to take advantage of the fundamental shift in network architecture driven by changing end-user demands, and our strong quarterly and first half of 2013 performance are a direct result of that strategy. Our unique ability to provide customers convergence, automation, openness and software intelligence positions us to lead the industry in this shift,” said Gary B. Smith, president and CEO of Ciena. By the end of June, EE's 4G network will reach over 55% of the UK population, and will cover 98% by the end of 2014. Throughout 2013, EE will continue to expand to key towns and cities across the country, including Aberdeen, Bath, Bournemouth, Brighton, Cambridge, Ipswich, Middlesbrough, Northampton,Norwich, Poole, Plymouth, Portsmouth, Swansea and York. EE also said the average downlink speeds on its LTE network is 19.4 Mbps. Panzura, a start-up based in San Jose, California, raised $25 million in Series D funding for its cloud storage solution. Panzura offers a cloud-integrated storage system for enterprises with network attached storage (NAS) functionality, native cloud support, a globally distributed file system, built-in FIPS 140-2 certified security and data protection, as well as high speed data transfer rates to and from the cloud. The company said its customer base grew by 700 percent in 2012 and that it now had the largest number of petabytes under management. The latest funding round was led by Meritech Capital Partners with participation from its existing investors Matrix Partners, Khosla Ventures, Opus Capital and Chevron Technology Ventures. "Panzura is delighted to be adding the expertise of our new partners at Meritech, and particularly late-stage funding guru Paul Madera to our board, and we are encouraged by the ongoing support of our existing longtime partners,” said Randy Chou, CEO and co-founder of Panzura. “Panzura provides the only viable cloud-based solution for the enterprise, directly enabling high-value business objectives – such as improved cost, scale, management, availability and global access – while fitting seamlessly into existing IT infrastructures." 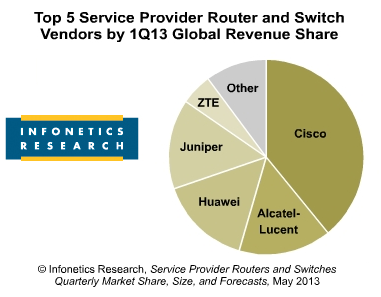 Pushed lower by weakness in Europe, global service provider router and switch revenue declined 17% in 1Q13 from 4Q12, and is down 6% from the year-ago quarter (1Q12) but is expected to grow at 8.8% CAGR through 2017, according to a new report from Infonetics. “The 1st quarter is normally down for routers and carrier Ethernet switches, so it’s better to look at the longer-term trends,” explains Michael Howard, principal analyst for carrier networks and co-founder of Infonetics Research. “The main growth drivers – the transition from TDM to packet and rising video traffic – are still in effect, the U.S. economy is slowly improving, and a number of large operators in the Euro zone intend to spend. Given these factors, we expect the router and CES market to grow at an 8.8% CAGR through 2017." 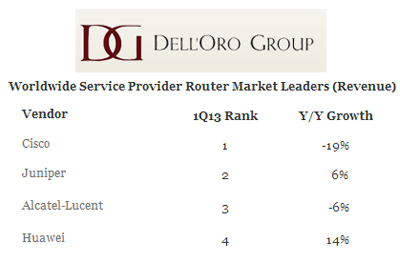 The Service Provider router market declined in the first quarter of 2013 mostly due to reduced carrier spending in North America and Europe, according to a newly published report by Dell’Oro Group. Quarterly market revenue growth has been stagnant since mid-2011, which was the last time the market experienced double digit growth. “Router investments in North America have softened as certain application deployments, such as mobile backhaul, have tapered,” said Shin Umeda, Vice President at Dell’Oro Group. “In Europe, continuing macroeconomic uncertainty has driven service providers to reduce their capital expenditures by 10 percent in the quarter, and consequently reduce their router deployments,” added Umeda. Dell'Oro said Cisco Systems, Juniper Networks, Alcatel-Lucent, and Huawei Technologies accounted for 94% of the Service Provider Router market. 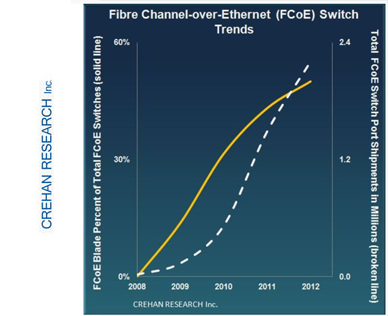 The Fibre Channel-over-Ethernet (FCoE) segment posted greater than 20% shipment growth in 1Q13 over the year-ago quarter, according to a new report from Crehan Research. Blade server interconnects, which account for less than a fifth of the total market, continue to drive FCoE growth and now comprise more than half of all FCoE port shipments. In contrast, the Fibre Channel switch market experienced a decline in 1Q13, with shipments falling 7% both quarter-over-quarter and year-over-year. The report cites weakness at some of the large storage OEMs, in addition to a pause in purchasing by Cisco's customers in anticipation of its recently announced MDS 9700 platform, as contributors to the quarter's soft results. "Given the importance of space, cable, power and component savings within blade servers and their chassis enclosures, and the fact that FCoE and convergence offer improvements across all these vectors, it's not surprising that FCoE adoption has been strongest in the blade server segment of the market," said Seamus Crehan, president of Crehan Research. "This growth is further bolstered by the fact that some parts of the FCoE solution are being offered at no additional price premium," he said. Mirantis, a start-up based in Mountain View, California, raised !10 million in a second round of Series A financing backed by Ericsson, Red Hat, and SAP Ventures, along with existing investor WestSummit Capital. Mirantis previously raised $ 10 million in December 2012 from Dell Ventures, Intel Capital, and WestSummit Capital. Mirantis offers software and services for running production-grade OpenStack clouds. Its solution provides a visual interface as a single control plane for OpenStack clusters and enables automated hardware discovery and network verification. Mirantis also supports the latest Grizzly OpenStack release. To date, Mirantis’ Fuel tools have been free and are open source under Apache 2.0 license. Later this year, the company plans to release Fuel Enterprise, the commercial grade distribution of Fuel that will be available exclusively to its subscription customers. Colt Technology Services provided a 10G backbone link for delivering HD video to over 40 screens at Germany’s largest film festival. The network used the ADVA FSP 3000 WDM transport platform.